As you may know, the allergy season has started in full force! At least in our house anyway. 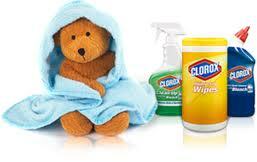 To help prepare Clorox provides advice to help them make our homes free of sneezing and allergens. While children are sleeping, keep your stuffed animals in a plastic bag in the freezer for several hours. The cold will kill dust mites, which are considered major causes of allergies. Use cleaner with bleach, like Clorox Clean-Up with Bleach to clean and disinfect tubs, showers, shower curtains, sinks, ceramic tile, glass fibers and synthetic marble. This will help prevent the growth of any mold.